Folksy :: Buy "Bertie Bunny and his Carrot"
Introducing Bertie Bunny....and his carrot. Bertie is needle felted from pure Merino wool in a lovely mottled light brown, he looks like a chocolate rabbit. Bertie is decoration only and not recommended for little ones due to small parts. Folksy :: Buy "Nixie the Water Sprite"
Folksy :: Buy "Ahoy There! 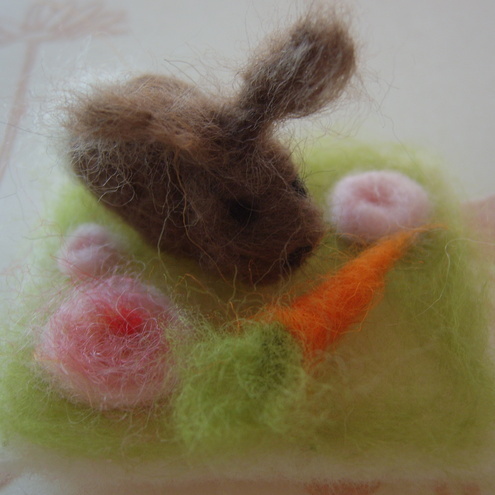 ACEO"
Folksy :: Buy "Vince The Amazing Carrot Carrying Bunny"
Folksy :: Buy "Violette Lapin - An Alternative Easter Bunny"